Following the appearance of Hedwig in the blockbuster Harry Potter films, snowy owls have become increasingly popular. ‘Snowy Owl – Queen of the North’ is an intimate and remarkable story that reveals the truth about these amazing creatures. It follows one pair of snowy owls as they struggle to raise young on the North Slope of Alaska, 300 miles inside the Arctic Circle. Though adults can survive year round in the Arctic, immature snowy owls head south to escape the worst of the weather. They are attracted to open areas that resemble their tundra home- in this instance, a farmland in Wisconsin. The film opens with stunning images of immature snowy owls perfecting the skills that will one day allow them to live year round in one of the most difficult environments on Earth. Adults can survive year round in the barren, frozen Arctic. No other owls are capable of surviving such extreme conditions. As the dark winter months give way to the 24-hour daylight of the Arctic summer, the opportunity to breed arises. However, breeding in such an uncertain environment is a serious challenge. When summer arrives, our pair attempt to breed in unusual circumstances. To do so successfully, snowy owls are dependant on one species- the brown lemming. This year, lemming numbers are low. In fact, they are so low that ours are the only breeding pair in an area that can have over thirty nests in a good year. Five owlets hatch and they face a struggle if any are going to survive. With so few lemmings, the male owl is forced to adapt. He catches a phalarope, but there won’t be enough of these birds around to raise the owlets. They need lemmings; but as the female joins the search, she begins to spend an increasing amount of time away from the nest. In her absence, all of the owlets leave the nest mound to escape the constant, freezing wind. Events take a turn for the worse as, despite the adult’s best efforts, hunger and cold take their toll on the youngest owlet. 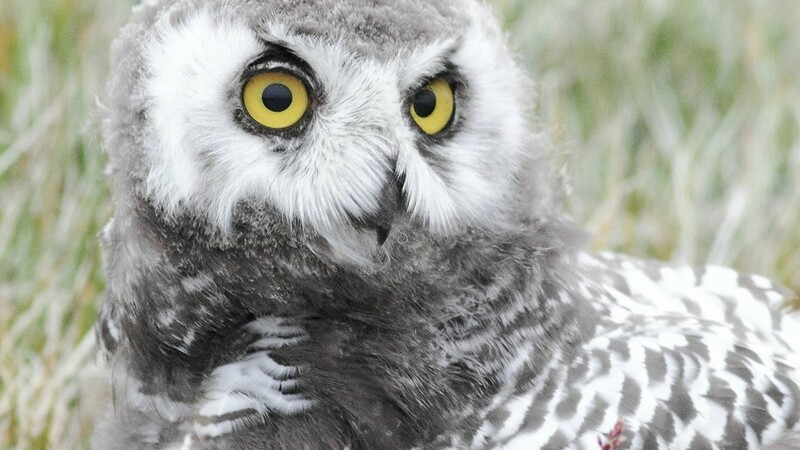 As the youngest grows weaker, the female shows a rarely glimpsed and caring side to snowy owls, as she refuses to give up on her youngest owlet. In the end, it is all too much and the owlet dies. Astonishingly, with no other food coming in, she then feeds the lifeless body to her other four owlets. The remaining four snowy owlets set out on foot across the tundra. Seemingly guided by the adult owls, the owlets survive days of freezing rain and a close call with a family of polar bears, until they reach a river. Not only does this barrier bring the journey to a halt, but there are also millions of biting mosquitoes in the area. The owlets then do something remarkable- they swim across the freezing river. Having finally reached an area with more food, no bears and fewer mosquitoes, the owlets take to the sky for the first time. This is just as well, as they will need to fly further south to survive winter.